You have values, am I right? A set of what you might call ‘core’ values that you’ve defined within yourself over the years. Maybe they revolve around your priorities, your commitment to your family, your ethical standards or your faith. But what about your business? 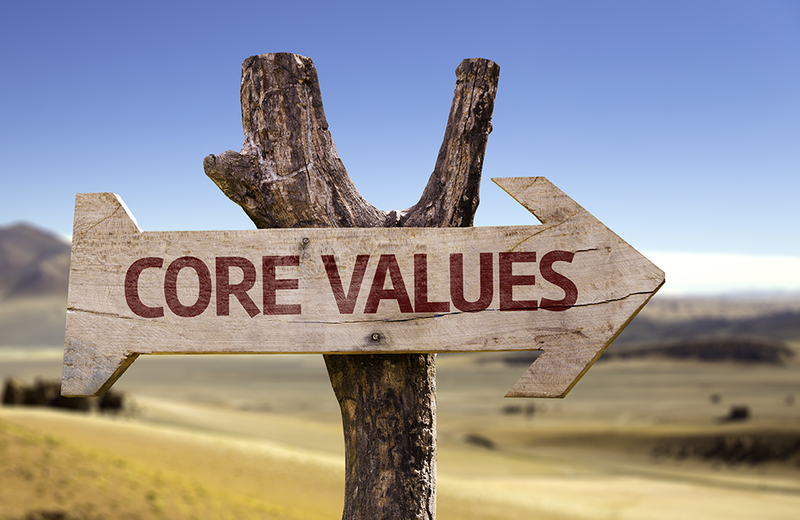 Does your business have a set of clearly defined core values? Have you ever even thought about them? Core values are slightly different from standards. You almost certainly have very high standards and it’s a good thing too: businesses rarely survive without them! But your core values are different, they are tangible; they are the rules by which you govern your business and they set you apart from other people. In short, your core values are part of your brand. 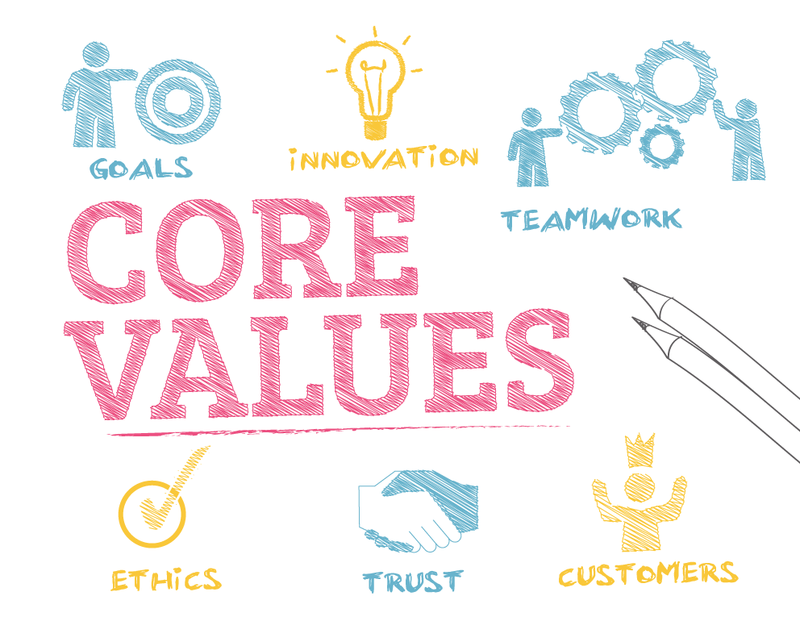 Much like a business strategy or marketing plan, core values need to be defined in order to make your business work. Yes you can bumble along without them for a time. Saying ‘I want to give the best possible service to my customers’ is all very well, but surely that’s the same for every business? Surely it’s a given? It’s like having a marketing plan that simply reads ‘get more customers’ – not very actionable is it?! Your core values are what help you operate with integrity and, if you can do that, then you WILL get more business. So, what do core values look like? “At Pink Lemon we are passionate, ambitious and results driven. This isn’t just part of the ‘blurb’, this is a carefully thought out summation of everything I want my company to stand for. It’s everything I want from my colleagues, my staff, my clients and, most importantly, myself. Passionate – I love what I do, and I’m guessing you do to, but in order to say that you’re truly passionate about something you need to feel it in every fibre of your being. When I was defining my core values I asked friends, family and colleagues to describe me as a professional. My love of design is overwhelming; it’s all encompassing – it’s second only to my love of my family, and that’s why it’s part of my core values. Ambitious – for me ambitious doesn’t mean that I want to make lots of money, or make a name for myself. I would like these things of course, but my ambition is so much more than a number or an award: it’s hard wired into every part of me. It’s a solid, actionable 5 year plan. It’s a crystal clear vision of what I want my business to become. It’s choosing my clients as carefully as I choose my staff because my business is a reflection of me. Results driven – This is, if you like, my USP. While any business person can claim to be passionate and ambitious these are, I’ll admit, somewhat unquantifiable qualities. However, when it comes to results, I believe that I truly set myself apart from my competition. I’ve seen far too many Marketeers create a brand, a website, a marketing strategy or something similar, then hand it off to the client and walk away. Marketing takes time; it takes dedication and if you’re not prepared to implement a series of solid markers to measure the success or otherwise of a campaign, then how can you possibly call yourself a success? That’s where I differ. That’s why results are part of my core values. So how do you define your core values? Well, for a start, your business’ core values should reflect your own. People have different priorities when running a business and you need to be honest with yourself about yours. If you want to help people but know you’re never going to be a millionaire then that’s fine – as long as your business is sustainable, you’ll make it a success. If you want to give your children the financial security you never had, then let your bottom line be your guide and work out how you can benefit your customers without depriving yourself. Whether you have ambitions beyond your local area or are content to stay small you need to be honest with yourself – your core values will see you right. If there’s a business similar to yours, or a business person you admire, look at their core values and how they manifest those values in the day to day running of their business. Let the people you admire be your inspiration. Remember that your core values are at the centre of everything you do in your business. If you have them clearly defined then your business will run more smoothly and decisions will come easier. Neglect them and you could find your strategy becoming chaotic. However, as important as this exercise is, it’s equally important not to panic! After all you’re not ‘creating’ core values, you already have them whether you recognise them or not. All you’re doing is allowing them to become solid – defining them so that you can define your business and, in doing so, take it to new heights.